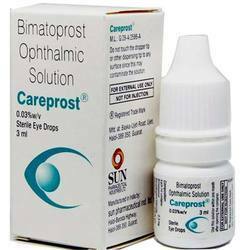 We are a leading 100% Export Oriented Unit of careprost eye drops, eye drops and bimatoprost from Kolkata, India. 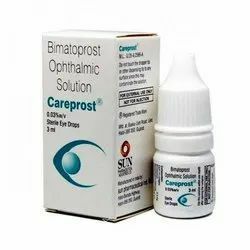 Careprost (Ophthalmic Solution) is an eye care medication used to treat patients with hypotrichosis of eyelashes or inadequate eyelashes. This medication aids in making the eyelashes more noticeable by increasing their growth and making them longer, thicker, darker. Ophthalmic Solution is similar to a natural chemical in the body called prostaglandin. SGE is a trustworthy name in the field that engages in proffering Careprost Eye Drop that is available at reasonable rates. These sterile eye drops are widely used for lowering eye pressure in glaucoma and improving eyelash growth. Offered eye drops contain a synthetic analogue of prostamide. Carepost is provided in tamper proof packaging in order to prevent contaminants.